Repost: The Passat TDI: all 48 states, but how many MPG? Some road trips are more epic than others, and I’m excited to announce that we have a pretty epic one planned. 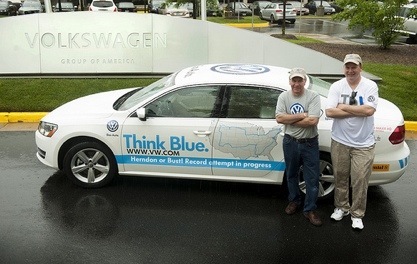 Today, two drivers, Wayne Gerdes and Bob Winger, depart from Volkswagen of America’s Herndon, Virginia headquarters in a 2013 Passat TDI® Clean Diesel. They’ll drive it 8,000 miles and pass through all 48 contiguous states over the next two weeks. The two friends are challenging the current Guinness World Record achievement for the lowest fuel consumption—48 U.S. states for a non-hybrid car*. If anyone can break the current record of 67.9 mpg in the Passat TDI, it’s Wayne. He’s an automotive journalist and founder of cleanmpg.com, an online community dedicated to fuel economy. He’s set mileage records in more than 100 vehicles, including the record for lowest fuel consumption—48 U.S. states with ahybrid vehicle. Wayne will do most of the driving, but will share those duties with Bob, an electronics engineer with a history of energy and conservation projects. For the trip, the Passat TDI clean diesel will run on Shell ultra-low-sulfur diesel fuel and Continental PureContact® with EcoPlus® Technology tires, which help improve fuel efficiency. The car also has a Linear Logic ScanGauge II® for precise fuel economy measurements and a Motorola® Droid® RAZR MAXX™ HD smartphone to provide Guinness World Records tracking requirements. Wayne and Bob will be stopping along the way to share their experiences on our Facebook, Twitter, and Instagram channels, so check in to see when they’ll be driving through your state. You can also track their trip by following the #VWTDI hashtag.